Genesis has extensively detailed the 2019 G70, but there’s one thing the company hasn’t revealed – the price. That’s changing today as the automaker has confirmed the new sedan will cost $34,900 in the United States. Costing exactly the same as the 2018 BMW 320i, the entry-level G70 2.0T Advanced features a stylish exterior with LED daytime running lights and 18-inch alloy wheels. The model also comes equipped with a perforated leather steering wheel, a dual-zone automatic climate control system and power front seats with leatherette surfaces. Buyers will also find an auto-dimming rearview mirror, HomeLink and an 8-inch infotainment system with Apple CarPlay and Android Auto compatibility. Speaking of technology, the base model comes nicely equipped with an assortment of driver assistance systems including High Beam Assist, Lane Keep Assist and Blind-Spot Collision Warning with Rear Cross-Traffic Alert. Other features include Smart Cruise Control with Stop & Go and Forward Collision Avoidance with Pedestrian Detection. A turbocharged 2.0-liter four-cylinder engine resides under the hood and it produces 252 hp (188 kW / 255 PS) and 260 lb-ft (352 Nm) of torque. It is connected to an eight-speed automatic transmission which sends power to the rear wheels. All-wheel drive is a $2,000 option and models with the system also feature a heated steering wheel. The G70 2.0T Elite starts at $39,900 and it has additional standard equipment including LED headlights, rain-sensing wipers and a sunroof. Buyers will also find a more luxurious interior with heated / ventilated leather front seats, a power tilt / telescopic steering wheel and aluminum trim. Rounding out the highlights are GPS navigation, approach lights (with the Genesis logo) and a 15-speaker Lexicon audio system. 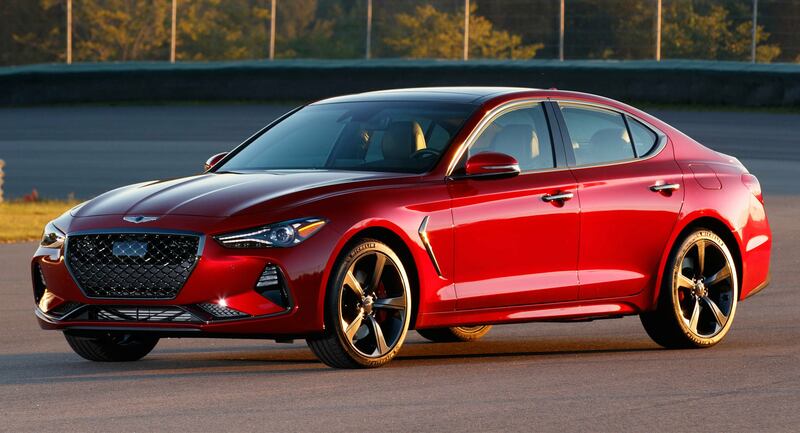 Buyers looking for something even more upscale can order the G70 2.0T Prestige which starts at $44,900 and is only available with all-wheel drive. It comes with quilted Nappa leather upholstery, a microfiber headliner and a driver’s seat with a power cushion extension. Other additions include a head-up display, a wireless smartphone charger and a surround view monitor. Drivers looking for something sportier can opt for the $43,900 G70 2.0T Dynamic which adds a limited-slip differential (on RWD models) and 19-inch alloy wheels with summer tires. Sitting one step above is the G70 2.0T Sport which costs an additional $1,000 and adds alloy pedals and special sport quilting on the Nappa leather seats. The model also has a more distinctive design thanks to a dark chrome grille, copper headlight bezels and tinted taillights. Thankfully buyers won’t have to spend that much money to get a performance-oriented model. Fans of manual transmissions can order the G70 2.0T Sport 6MT which has a base price of $37,900. It comes equipped with a number of performance features including a limited-slip differential, a Brembo braking system and 19-inch wheels with summer tires. Other highlights include a sports exhaust system and LED headlights. The interior isn’t too shabby either as drivers will find heated / ventilated front seats, aluminum trim and a power tilt / telescopic steering wheel. The model also has alloy pedals and a 15-speaker Lexicon audio system. Buyers looking for more power will need to shell out at least $43,750 for the G70 3.3T Advanced. In return, they’ll be reward with a twin-turbo 3.3-liter V6 engine that produces 365 hp (272 kW / 370 PS) and 376 lb-ft (509 Nm) of torque. The model is loosely based on the G70 2.0T Elite, but it gains additional features including a sport-tuned suspension, a limited-slip differential, a variable steering system and a dual exhaust system. The G70 3.3T Elite starts at $45,500 and it adds rain-sensing windshield wipers, parking sensors, a sunroof and a wireless smartphone charger. Moving up to the $48,000 G70 3.3T Prestige rewards customers with a head-up display and a surround view monitor. Luxury touches include quilted Nappa leather seats, heated rear seats and a microfiber headliner. Lastly, there’s the G70 3.3T Sport which has a base price of $49,500. It has a revised exterior with a dark chrome grille, copper headlights bezels and tinted taillights. Other highlights include alloy pedals, sports quilting and an electronically controlled suspension. That's a great starting price for the G70. Looking forward to finally test driving one.